This event will take place December 5 - 8, 2016 in Tehran, Iran. 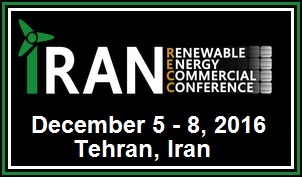 IranRECC 2016 is designed to help you access the Iranian renewable energy sector. At IranRECC 2016 you will find more than 45 senior level industry speakers. Almost three-quarters of those in attendance are directors. There will be 3 days of content with 3 technical workshops and more than 40 hours allocated to networking. A need for greater energy security, falling global oil & gas prices and rising domestic power demand has led to a committed focus on renewable energy development in Iran. The Iranian government and policy makers have set an ambitious renewable energy target of 5GW by 2020. Following the sanctions relief coming into effect and Iran re-entering the international trade and financial markets now is the time to coordinate your strategy for this new renewables market. Our high quality, content lead programme will provide in-depth analysis of the prospects in the Iranian renewables space and highlight best practice in project development and financing. Don’t miss this chance to capitalize on the country’s growing commitment to green energy – 5GW of electricity from renewable sources by 2020! IranRECC 2016 is truly the first and only event dedicated to bringing the international and domestic communities together to discuss the critical challenges and issues facing Iran’s clean energy sector, backed up by the expertise you need to navigate the business landscape and the government figures that will be driving the reform. Senior industry leaders will not only be speaking, debating and presenting during conference sessions they are also attending and actively looking to source new solutions and partner with new and existing players for new and ongoing projects and developments. Profile and position your company on the conference program as a speaker or a panelist. If you are seeking to raise your brand in Iran’s new renewable energy market, this is the time and place to do it. Global leaders in renewable energy will be confirming their place to speak in front of our audience of senior delegates and attendees; can you afford to fall behind in this market.